Attention all you cheese lovers: this show is for you! 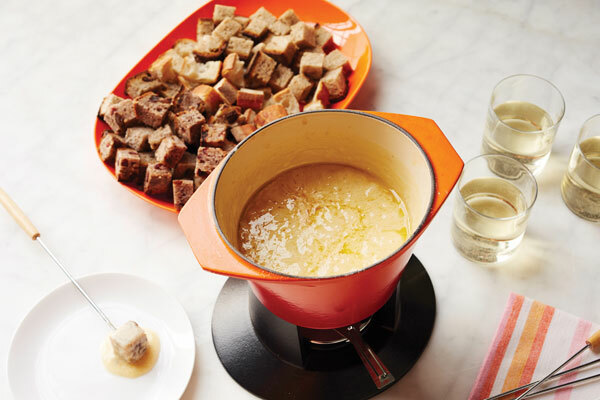 Discover how Martha makes homemade Ricotta, classic Fondue, Fettuccine Alfredo, Raclette and grown-up Grilled Cheese. Martha demonstrates how to melt Raclette using a Raclette Heater. This fresh ricotta recipe appears in an episode of Martha Stewart's Cooking School. Add lemon juice, gently stirring until just combined. Remove pot from heat and let stand 5 minutes. The combination of the acid and the residual heat in the mixture will cause it to coagulate, or curdle -- separating into a soft mass (curds) and a cloudy liquid (whey). After lining a mesh colander with 4 to 5 layers of cheesecloth and placing it inside a deeper, slightly larger bowl, gently pour curds and whey into colander. Let mixture stand, pouring off whey occasionally, until most of the whey has drained from still-wet curds, 20 minutes. Gather up ricotta in cheesecloth and turn it out into a bowl. Serve within a few hours, or refrigerate up to 4 days. For a denser ricotta, which can be preferable for baking, hang it to drain for another hour. Repurpose whey or discard it. Serve ricotta with Rhubarb Compote. For the Rhubarb Compote: Place the rhubarb, sugar, and water in a medium saucepan set over medium-low heat. Simmer gently, stirring occasionally, until sugar is dissolved and rhubarb is almost tender, about 8 minutes. Using a slotted spoon, remove the rhubarb from the liquid, and transfer to a medium bowl; set aside. Raise heat to medium, and continue simmering liquid until thickened and reduced to 1/2 cup, about 10 minutes. Remove from heat. Transfer reduced liquid to a small bowl to cool. Add the cooled, thickened liquid to the reserved cooked rhubarb, and stir to combine.